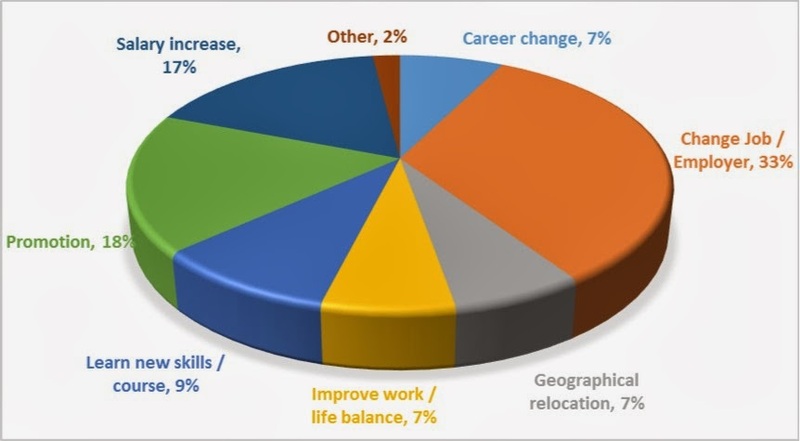 As we looked at the year ahead, Peak Performance devised a poll asking people ‘What are your career aspirations for 2014?’ The poll finished at the end of February 2014, having received 250 responses. What is interesting about the result, is that two of the top three results, ‘Promotion’ and ‘Salary Increase’ (totalling 35% of respondents) are areas potentially within the control of their current employer. This begs the question: do employees feel that they are limited within their own organisation? Aircraft lessors are typically quite lean organisations and, with that, opportunities to progress internally are not always available. This may, explain why 32% of people responded to say they would like to change employer. Often, we notice particular candidate interest toward start-up opportunities. People like to be part of that exciting growth period and to be provided with the opportunity to advance their career and be rewarded through the growth stages. We also see new opportunities for change stemming from the growing interest from hedge funds and other investors looking at aircraft leasing as a suitable investment space. Companies like First Star, who have opened their doors to aircraft leasing and Apollo Aviation who recently raised USD$640 million in funding for aircraft and engine acquisitions. These funds, as well as others, need staff, both to originate and manage the transactions. People have a natural curiosity to see what is new and with that they are always keen to see what opportunities there are for them. On the reverse side, ILFC the 2nd largest lessor will soon merge with Aercap and this may create duplication of roles and bring new candidates into the job market. Both ILFC and Aercap have offices in China, Singapore, USA, Amsterdam and Ireland. No doubt Aercap will seek to gain efficiencies across the board. As with promotion, people are usually hungry for some form of advancement. As we see mid-sized lessors continue their growth, people’s roles become more defined and organisations need to establish more structure to manage increases in deal flow. Learning new skills is closely related to promotion as people seek to develop their skill sets to allow them to take on new roles and of course enhance their own contribution. In Ireland there has been a lot of media coverage around the growth of the aircraft leasing industry. We frequently advise people on the prospect of a ‘Career Change’ into the space. It is not widely understood that lessors differ from airlines which are more people intensive. Internally, we have dealt with a high number of enquiries from people wishing to ‘Change geographical location’ and relocate to Asia from both Europe and the US. These people are often happy to work on a local contract basis, not requiring the burden of expensive expat conditions. This is across all disciplines within aircraft leasing. We find this interesting as the majority of requirements we receive from lessors that want to expand in Asia require finding locals or people already based there. Asia has seen continued growth with further demands for experienced staff in the region, yet the region is still in its infancy, with many lessors fighting for a very small pool of people. If employers were willing to relocate or hire someone on a contract they could have a larger pool of people to choose from who have the required level of experience. Attaining proper ‘Work Life Balance’ is always a challenge within aircraft leasing, given the 24/7 nature of the business. However, some companies are better than others at ensuring their organisations are sufficiently staffed to allow people breathing space when required. This is also often common within law firms where people are known to work excessive hours. In conclusion, we believe that individuals within the aircraft leasing market are highly motivated people, otherwise they would not survive the demands put on them. This high level of motivation means people want to be continually challenged in their work and rewarded for their efforts. From an employment point of view the industry at present is the most vibrant it has been since the credit crunch. With so much activity and interest in the market at present, people have a natural curiosity to see what other opportunities are available. Findesinvest Finanz Auto ohne Bank. Leasing Wenn Ihr Kredit-Rating ist nicht über jeden Zweifel erhaben? Wenn Ihr Budget es zulässt, können Sie ein Auto bei uns mieten.